There are tricks to appearing confident, but there is a fine line between confidence and arrogance. Unfortunately this line is usually determined unconsciously by the “audience” based on their own level of confidence. Then we have those that are just too damned cocky, but that’s an entirely different post! The biggest thing about confidence is patience and the key to patience is in learning your triggers. What types of situation or personalities trigger your insecurities causing you to react negatively? Vulnerability is an important social tool, but sometimes no one needs to know when you're not feeling confident. You need to be confident to make a great impression, but in unfamiliar situations or with unfamiliar people being confident on the outside is far more important that being confident on the inside. Lots of things make a person confident, all can be learned, and fortunately we are already masters at some of them. Taking a look at the traits I wrote about here, how can we develop them? If you consider the opposites it might be easier to see how to fake it. Learning to believe in yourself and reaching for new challenges instead of watching opportunity pass you by and allowing external circumstance to affect your life are how to build confidence. Once you achieve it on the outside, you will start to feel it on the inside. Confidence is earned by hard work. So how? This is what I have done and continue to try and do. Some days it is easier than others! 1. Take an honest look at yourself and be a realist. Do you have goals that you work towards or do you have "when I'm slimmer/in less debt/ in a relationship then I'll …" goals? Conceit or confidence? 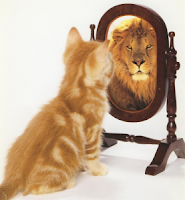 Do you just talk the talk (conceit) or do you walk the walk (confidence)? What are your weaknesses? What can you do to start to develop them into strengths? What are your strengths? Knowing your strengths helps to maintain belief in yourself when someone criticises you, fairly or not. When you're feeling insecure you're more likely to be aggressive than assertive. Once you're more aware of strengths and weaknesses you should begin to keep insecurities under better control. Happiness comes from within. Burst that bubble of comfort and do the scary thing! 4. Fix personal and business relationships. Broken relationships breed criticism and negativity. Where did the relationship break down? What can you do to repair it? Is it important to you to repair it? If not, maybe it's time to let go. Having confidence means that you don't value another's opinion of yourself to the detriment of your own. Listen more than you speak. You learn and grow from listening. Celebrate other people and their achievements. Everyone is better than the other at something, so don't judge them or yourself against them. If we all had Beckham's right foot then it would no longer be special. 5. Dress for success. People say dress for the job you want, not for the job you have. I thoroughly agree. However, I also say dress for who you are. What we wear can have a huge impact on our confidence or lack of and on the aspects of personality that we show. If you work in a very corporate environment, but you like bright colours, the 1950's, or the androgynous look, find ways to blend this into what is seen as the social norm. Start small, but always be yourself. 6. Have an affirmation. Self-doubt creeps in during the quiet moments, when you're trying to fall asleep or brushing your teeth. Having an affirmation to battle those demons can be a great help to boost confidence. When my illness was at its peak and it took everything I had just to haul myself out of bed I would tell myself that I am stronger than my illness, that I will not become the negative statistic. It worked, most of the time. I have a list of achievements, things I have done that I am proud of, so I read that when I need a reminder of everything I have achieved in my life. 7. Have a positive outlook. Divorce is one of the most stressful moments in life. When I was going through mine I was working for a surgeon specialising in cancer treatment. No matter how rubbish I felt, how bad my life seemed (even though it was my choice to divorce), at any given moment one of those patients could ring me and I would be reminded as to how blessed my life actually is. I try to look for the positive in everything now so much so that there are times my friends want to throttle me. Henry Ford said "whether you think you can, or you think you can't – you're right". A positive mindset is powerful.